we flew at ten, at twelve. beyond the boggy cow pasture. the first tug, would it hold? It held, always held, that string. we lay on our backs in the tall grass. for kites but bare of kites. strips from dishtowels worn through. above the stratosphere by now. about whether clouds could see us. © by Diane Lee Moomey. Diane Lee Moomey grew up near the Great Lakes and, since then, has lived and wandered around the U.S. and Canada. These days, she dips her gardener's hands in California dirt, and reads and listens regularly at poetry venues in the San Francisco Bay Area. 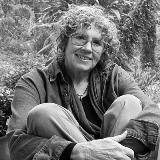 Diane has published three books of poetry and prose and won a prize or two along the way. Currently, she is co-curating a monthly poetry series in the Bay area. Besides poetry, Diane enjoys long walks beside the ocean, reading mysteries, and painting in watercolors. Learn more about her at https://www.pw.org/content/diane_moomey and www.dianeleemoomeyart.com. I can feel the warm breeze and, I love cows! Great poem! Thank you for reminding me of the joy kites! May there always be children young and old who delight in them. Beautifully written. As a teacher, I worry that my children want to grow up too quickly. My wish for them is that they take time to let the wind tug at the hearts and kite strings. What a wonderful memory-poem. It builds to a truly poignant observation. Enjoyed this so much Diane. Returns me to my youth. Marvelous use of detail. TU! !